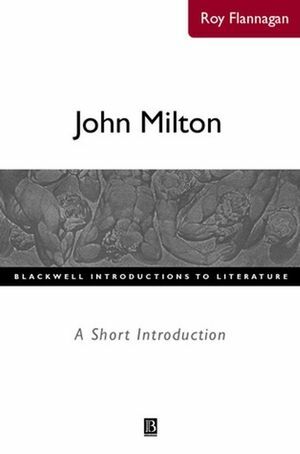 In this compelling first volume in the Blackwell Introductions to Literature series, Roy Flannagan, editor of The Milton Quarterly, provides a readable and uncluttered critical account of a complicated and sophisticated author, and his poetry and prose. began what was to become the Milton Quarterly in 1967. He has been the President of the Milton Society of America, and he followed C. S. Lewis and Northrop Frye as Honored Scholar of the Society in 2001. Editor of the Riverside Milton, he is also President of the Council of Editors of Learned Journals. After 32 years at Ohio University, he has taken the position of Scholar in Residence at the University of South Carolina at Beaufort. 2. Milton's Private and Public Education. 3. Educated Milton: John Milton, Gentleman. 5. Milton the Omnivorous Reader. 16. The Myth of the Unattractive Milton. 19. Milton's Sense of Humor. 20. Milton's First Great Poem. 23. Elegies in Latin and English. 24. Decorum, Genre, and Modes: the Nativity Ode. 26. The Serious and Even the Puritan, Masque. 28. The Masque often known as Comus. 33. The One Just Man, or Woman. 35. The Reason of Church-Government. 38. Divorce as a Serious Subject. 41. Plans for Great Tragedies. 43. The Baroque in Space and Time. 47. The One Just Man. 50. "Satan, He's a Liar". 51. Satan, Sin, and Death. 52. Plot and Parallel Scenes. 56. Slow Reading, on Purpose. 60. The Printing of Paradise Lost. 64. The Plot of the Brief Epic. 65. Paradise Regain'd and the Problems of a Cold-seeming Son of God. 66. Problems of Presenting a Speaking Jesus. 67. The Son as Student. 69. Epic Devices in Miniature. 71. Searches for Meaning in Epithets. 72. Socrates, the Biblical Job, etc. 76. Samson Agonistes and the Problem of Dating. 77. The Plot of the Dramatic Poem. 78. The Agon or Struggle in Samson Agonistes. 80. The Temptations to Luxury or Idleness. 81. A Chorus You Can't always Believe. 82. Quiet Closure of the Tragedy and the Short Epic. 83. In the End, "One's country is where it is well with one. ".